Part 3 of the Not On My Farm initiative from MSD Animal Health. Regimentally adhering to vaccination protocols and covering all stock against IBR has almost eliminated Pneumonia on one beef farm. 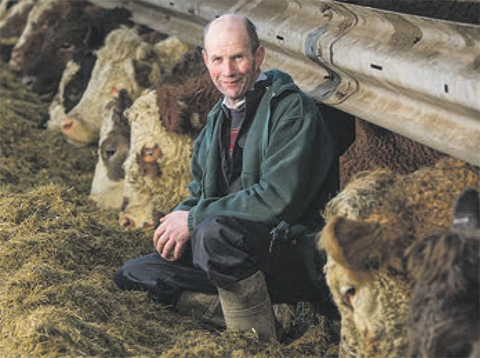 Castle Douglas beef farmer, Alec Millar believes making sure calves are fully vaccinated against the main causes of respiratory disease in advance of housing is vital to ensure calves remain healthy and grow. His vet, Jimmy More from Galloway Farm Vets is in agreement. He commonly sees respiratory disease issues in beef calves post-housing due to the stress of housing and weaning and the added disease challenge from stock being housed in a confined air space. Failing to adhere to vaccination protocols also adds to the risk. At Balannan Farm, spring-born calves are housed around October/November. The Millar family runs 500 Simmental cross and Aberdeen- Angus cross suckler cows, which predominantly calve in the spring. Most calves are finished on farm, with about 100 sold as stores. The farm has always experienced some level of calf pneumonia and has followed a vaccination policy to cover Bovine Respiratory Disease (BRD). BRD includes pneumonia, and can be caused by various infectious agents, one of which is Infectious Bovine Rhinotracheitis (IBR). About four years ago, Mr Millar experienced an outbreak of respiratory disease, with about 50 per cent morbidity and 5 per cent mortality. Calves displayed clinical signs such as runny noses and eyes with nasal swabs identifying IBR as the causal agent. As a result, the farm revamped its vaccination strategy. This included deciding to vaccinate all stock against IBR, rather than just the calves, ensuring 100 per cent timing compliance on vaccine administration and using the live IBR vaccine, Bovilis IBR Marker Live. As animals from nine to 20 months of age are housed in one shed, vaccinating all groups would help reduce IBR shedding and reduce the disease challenge. Mr More also felt a live vaccine against IBR would be more effective on this specific farm. Now, all spring-born calves are vaccinated with Bovilis Bovipast RSP in September. This covers animals against the common viruses (PI3 and BRSV) and bacteria (Mannheimia haemolytica). They then receive a second dose, four weeks later in adherence with data sheet recommendations. At the same time, they also get Bovilis IBR Marker Live vaccine up the nose. This is aimed at combating disease outbreaks. All other cattle also receive a Bovilis IBR Marker Inactivated vaccine as an injection at this time. This is designed to reduce shedding of IBR into the environment. As BVD can cause immunosuppression and hence BRD, all cows and replacement heifers are also vaccinated against BVD using Bovilis BVD. The farm is currently BVD negative. Since implementing this farm specific vaccination policy, pneumonia has become a thing of the past, which has ultimately benefited calf performance. Compared with antibiotic usage during the disease breakdown four years ago, Mr More says the farm is now using 200 per cent less antibiotics, while also reducing death rate from 5 per cent to negligible. This has all come about without any changes to housing or management, just vaccination strategy.